Belovezhskaya Pushcha became the property of the royal family in 1888 in exchange for lands in the Orel and Simbirsk provinces. After the construction of the Belovezhsky Imperial Palace was completed, Alexander III, Nicholas II, Grand Dukes often hunted in the Pushcha. In the town of Bialowieza (now Poland) a palace was built - a luxurious hunting residence with a beautiful park of 50 hectares. Only the entrance gates and several surrounding structures survived. There are numerous photographs of Nicholas II during the hunt in these places. Grand Duchess Tatiana Nikolaevna reported with great enthusiasm on September 21, 1912 from Spala to her aunt - Grand Duchess Xenia Alexandrovna. "My dear Aunt Xenia ...": "It was terribly fun in Bialowieza. We went with Papa to hunt Olga and I. Marie was with Anastasia only twice." I stood two times with Papa on the number, since Prince Golitsyn, Prince Beloselsky and once at Drentina. "It was terribly good." View of the square in front of the railway station "Belovezh"; in the background - Belovezhsky Palace Вид площади перед железнодорожной станцией «Беловеж»; на заднем плане - Беловежский дворец. View of a part of a pond arranged in a park near the Bialowieza Palace in 1895 by the design of Valery Cronenberg. Вид части пруда, устроенного в парке у Беловежского дворца в 1895 г. по проекту Валерия Кроненберга. The Church of St Nicholas the Wonderworker in Bialowieza. Obelisk near one of the ponds of the Belovezh Palace. The view of one of the avenues of the park, broken around the Bialowieza Palace in 1895. Вид одной из аллей парка, разбитого вокруг Беловежского дворца в 1895 г. Members of the royal hunt during breakfast under a specially installed tent. Участники царской охоты во время завтрака под специально установленным шатром. Pavilion of Emperor Alexander II. View of one of the Belovezh palace buildings. View of one of the palace buildings. Pavilion of Emperor Alexander II. Вид одной из дворцовых построек. Павильон императора Александра II. Altar of the Orthodox Church of Belovezhskaya Pushcha. View of the altar of the Orthodox Church of Belovezhskaya Pushcha. Вид алтаря православной Беловежской церкви. Camp kitchen preparing breakfast. Belovezh royal hunting. Прислуга и повара у походной кухни за приготовлением завтрака для участников царской охоты. Группа егерей на одной из просек Беловежской пущи после окончания охоты. A group of huntsmen on one of the bays of the Belovezhskaya Pushcha after the end of the hunt. Residents of the village of Belovezh. Group of peasants. Residents of the village of Belovezh. Group of peasants. Жители деревни Беловеж. Группа крестьянок. View of the street of the village of Belovezh. View of the street of the village of Belovezh. Вид одной из улиц деревни Беловеж. Колодец. View of one of the palace buildings. Вид части парка вокруг Беловежского дворца; в конце дорожки - одна из служебных построек. Church of St. Nicholas. Belovezh. Церковь св. Николая. Беловеж. View of the imperial pavilion near the station Gainovka. Вид императорского павильона близ станции Гайновка. The view of the part of the bedroom of the emperor and the empress at the Imperial Hunting Palace in Bialowieza. Вид части спальни императора и императрицы в Императорском охотничьем дворце в Беловеже. The view of the part of the bedroom of the emperor and the empress at the Imperial Hunting Palace in Bialowieza. Кабинет наследника цесаревича в Императорском охотничьем дворце в Беловеже. Living room in the Imperial Hunting Belovezh Palace. Living room in the Imperial Hunting Palace in Bialowieza. Гостиная в императорском охотничьем дворце в Беловеже. The bathroom of the heir to the Tsarevich in the Imperial Hunting Belovezh Palace. The bathroom of the heir to the Tsarevich in the Imperial Hunting Palace in Bialowieza. Ванная комната наследника цесаревича в императорском охотничьем дворце в Беловеже. Dining room in the Imperial Belovezh Palace. Dining room in the Imperial Hunting Palace in Bialowieza. Столовая в Императорском охотничьем дворце в Беловеже. Billiard room in the Hunting Belovezh Palace. Billiard room in the Imperial Hunting Palace in Bialowieza. Биллиардная комната в Императорском охотничьем дворце в Беловеже. The huntsman is lucky in the cart of deer killed during the hunt. 1892. Егерь везет в телеге убитых во время охоты оленей. 1892. Empress Maria Feodorovna and others at the entrance to the hunting lodge. General view of the hunting house of Emperor Alexander III and the adjacent territory. General view of the hunting house of Emperor Alexander III and the adjacent territory. Общий вид охотничьего дома императора Александра III и прилегающей территории. Царское имение Спала, Ловическое княжество в Польше. Cooks and servants preparing dinner in the forest for hunting participants - members of the imperial family and guests. Deer killed during the hunt. 1894. Deer killed during the hunt. 1894. Олени, убитые во время охоты. Царское имение Спала, Ловическое княжество в Польше. 1894. A group of huntsmen near deer, killed during the hunt. 1894. A group of huntsmen near deer, killed during the hunt. 1894. Группа егерей около оленей, убитых во время охоты. 1894. Empress Maria Feodorovna with younger children - George (next to her), Michael and Olga. 1894. Императрица Мария Федоровна с младшими детьми - Георгием (рядом с ней), Михаилом и Ольгой. 1894. Emperor Nicholas II, members of the imperial family before the start of the royal hunt. Belovezh. 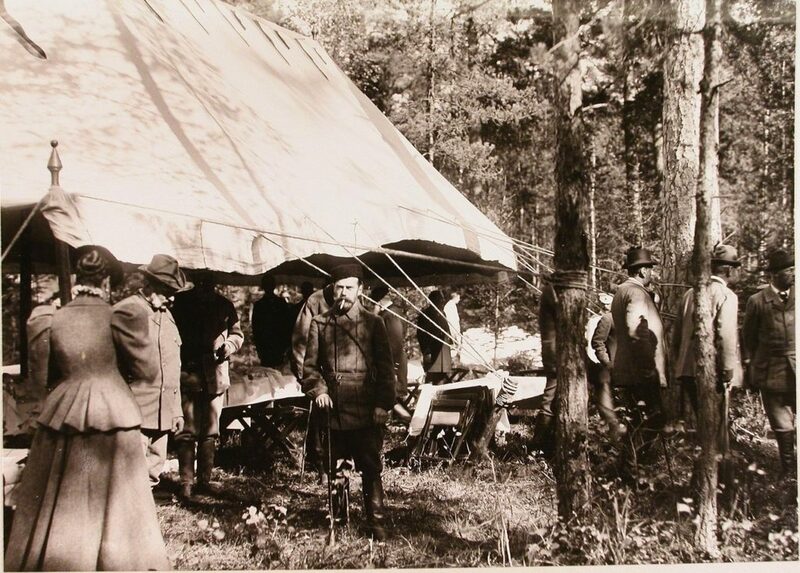 Serving staff members of the Belovezh royal hunting, at breakfast in the woods. Serving staff members of the royal hunting, at breakfast in the woods. Обслуживающий персонал участников царской охоты, за завтраком в лесу. Grand Duke Vladimir Alexandrovich in a carriage. Belovezh. Grand Duke Vladimir Alexandrovich in a carriage harnessed by four horses, before the start of the royal hunt. Великий князь Владимир Александрович в экипаже, запряженном четверкой лошадей, перед началом царской охоты. Cooks at the camp kitchen for preparing breakfast for the participants of the royal hunting. Повара у по.ходной кухни за приготовлением завтрака для участников царской охоты. A bison killed during the royal hunting. Зубр, убитый во время царской охоты. Commandant of the Belovezhsky Palace and his family. Belovezh Palace. Family members of the commandant of the Belovezhsky Palace and his staff on the porch of the house. Члены семьи коменданта Беловежского дворца и его штатные служащие на крыльце дома. Nurses of the Grand Duchesses Tatiana Nikolaevna and Olga Nikolaevna near the Belovezhsky Palace. Empress Alexandra Feodorovna in the carriage at the Belovezhsky Palace. Empress Alexandra Feodorovna in a carriage at the Imperial Palace in Bialowieza. Императрица Александра Федоровна в экипаже у Императорского дворца в Беловеже. Nurse Grand Duchess Olga Nikolaevna on a walk with the pupil. Near Belovezh Palace. Nurse Grand Duchess Olga Nikolaevna on a walk with the pupil. NearBelovezh Palace. Няня великой княжны Ольги Николаевны на прогулке с воспитанницей. The family of the commandant of the Belovezhsky Palace and his servants in the courtyard of the Orthodox church in Belovezh. Семья коменданта Беловежского дворца и его служащие во дворе православной беловежской церкви. A group of huntsmen in the forest before the start of the royal hunt. Группа егерей в лесу перед началом царской охоты. Group of local peasant women. Belovezh. Group of peasant women - local Группа крестьянок женщин - местных жительниц. Employees of the Bialowieza Palace at the entrance to the palace. The Imperial Palace in Bialowieza. 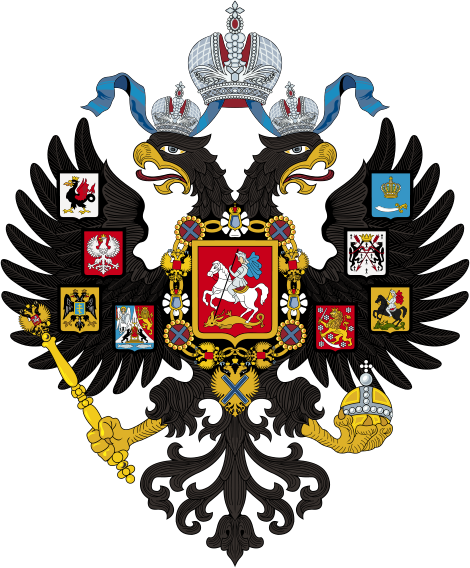 Russian empire. Служащие Беловежского дворца у входа во дворец. Императорский дворец в Беловеже. Российская Империя. Servants at the house for employees of the Belovezh Palace. Employees of the Bialowieza Palace. Servants at the house for employees of the Bialowieza Palace. Служащие Беловежского дворца. Прислуга у дома для служащих Беловежского дворца.